Thanks to those who visited us in stall MH MJ015 VII, 5-8 August 2016 at the IIJS show Machinery Section, The Lalit Hotel, Mumbai! As always, we provide exclusive and expanded offerings for your 3D printing & casting needs. ZLab3d/KNS are pioneers in jewellery industry 3D printing in India. New, exclusive products for your mould making and RPT casting! See us at stall C023B now, at IGJME in Mumbai! 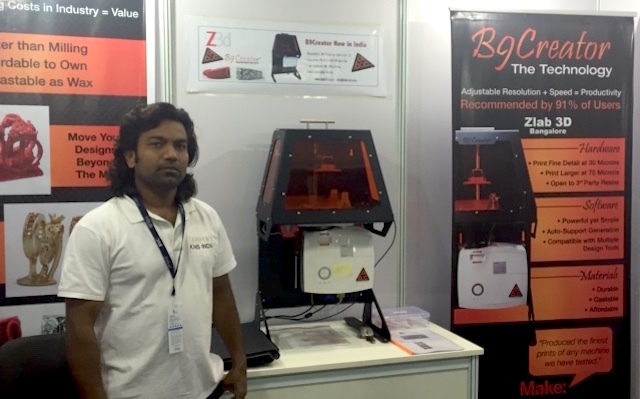 See India’s first source for B9Creator, ZLab3d, in stall C023B, 5-8 February 2016 at the IGJME show in the Bombay Exhibition Centre! A wealth of improvements and new features released in B9Creator software! In the announcement, there are links to the B9Creator software download page as well as noting that autoupdate is also possible. Follow the discussion of fellow users in a B9Creator 1.8.3 update Topic as well. -Added “Easy Peel” foundation shape. -Added Yellow and Emerald Material Settings. -Added ability to add multiple models to layout at a time. -Updated Layout view to allow for zooming out further. -Added ability to associate .stl file with the windows installer/app. -Added simple measuring tool to layout support mode. -Fixed issues with linux installer not including some of the correct packages. -Fixed not being able to select mirrored models in layout. -Saving job files now defaults to the file name found in the “Job name” field in the slicer plus appends the resolution. -Fixed firmware bug that left projector turned on in some lost comm situations. -Fixed firmware bug which could reset lamp hours to zero inadvertently. Just announced by Mike Joyce of B9Creations, these two new additions to the growing B9Creator resins family are especially good for casting, with reduced ash, faster printing times, and for those not casting, two cool new colors! – For use at all B9Creator XY resolution configurations and machine versions. – Designed to be sliced between 30 and 70 microns Z. Perfect for high details on small or large items. – Pigmented with green nano particles making it easy to visually verify surface details of the print. – Nano particle pigments stay suspended in the resin, virtually eliminating the “settling” issues experience with Red & Cherry. – ~85% less burnout residue (ash) compared to our already low ash Cherry! – Reduced exposure time (vs Cherry) yields ~12% faster prints on the B9Creator. – Designed to be sliced between 20 and 40 microns Z. Perfect for capturing extreme detail on your smallest items. – Yellow pigment stays suspended in the resin, completely eliminating the “settling” issues experience with Red & Cherry. – The translucent color can make it difficult to see the sharp details, but results in 100% less burnout residue (ash) compared to our already low ash Cherry! See results from other users in the “New Resins” Topic in the B9Creator Forum. Now or when you take delivery of the new resins, download the configuration update for your free B9Creator software, so your printer will be ready with a preset for these materials. printer settings for B9Creator Emerald and Yellow. Embraced by not just jewellers, B9Creator has been used to create part of a sculpture Go to B9Creator Forum thread about the art piece. We hope to hear from the first Indian artist to employ B9Creator for their works. B9Creations are rising the price of resins but they remain substantially lower than alternative resins. ZLab3d offers existing prices in India on B9Creations resin orders fully prepaid by Saturday, October 17, 2015. B9Creator Hands-on at IIJS 2015! See you there. We plan to have the B9Creator v1.2 printer there, it’s India’s most affordable SLA DLP printing solution yet achieves quality for jewellery production with its low-cost direct castable resins! Ask us about resins, consumables, and associated items for your full B9Creator printing experience.